Signmaking apprentice Louisa Jessop had to Google ‘signmaking’ when she found a job on Seek that caught her interest. Over a year later, the 26-year-old is doing a signmaking apprenticeship at signage company Signtech the sign masters based in Christchurch. “I saw a job on Seek that Signtech were advertising. It was an industry I was completely unfamiliar with. I wanted to see what the position entailed before applying for the job. I thought I’d give it a go since it’s a creative industry and I enjoy being creative,” Louisa says. Coming from a fashion and retail background didn’t deter the budding signmaker from learning a new craft. “When I first started I didn’t know a lot. The work can be difficult at times. But I really love the work I do. It’s a lot of fun,” she says. Louisa is grateful for the support from the Signtech team. Signtech Graphic Manager Duncan Nash says Louisa’s been a great addition to the team. “Louisa’s been awesome. She’s a keen learner and gets stuck into her work. She’s fitted in well with the team,” Duncan says. Louisa’s advice to people thinking of getting into the signmaking industry? Louisa is a Got a Trade? Got it Made! Future Business Leader. Got a Trade? Got it Made! 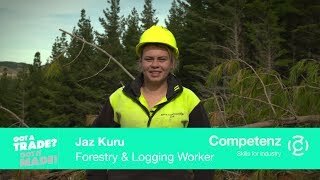 is a national campaign to raise awareness of on-the-job training and careers in New Zealand’s trades and services. It also celebrates the talents and achievements of young people making headway in their chosen vocation.